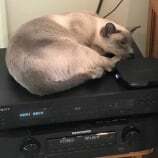 Looking to go with a dedicated digital music server and will require a NAS for the music that I own. Music library is large, guessing between 18-20T and will archive more as time allows. do this in the servers. Is anyone doing this and what would be your suggestion or recommendations please. I'm new to this so sorry for question but need to learn from the people that have a better grip on this than just reading and watching Youtube. Remote server cache "serves" no purpose for audio; the examples your are looking at (Aurender and Innuos) are caching directly attached hard drives. Sorry if I was misleading. My thought was that if Aurender & Innous both do cache for their servers then why not in a NAS that stores my music. What I meant is that both Qnap and Synology have NAS's that have 4,6 or 8 bay hard drives and in addition they also have two slots for 2.5 SSD to cache in order for the NAS to behave faster . If this isn't necessary then I won't spend the extra coin. The NAS will only be used as a music storage device. Roon, server portion along with the streamer is in a separate box which will be in my music room. The NAS will be in a separate room so that I can hear anything spinning or hear fan noise. UPNP play from a network NAS. Just use the NAS as a backup device. I'm left slightly confused with these responses. I use MinimServer installed on Synology DS412+ NAS. As my music library increased in size I began to notice an increase in the time it took to navigate the library remotely (with BubbleUPnP on an android tablet). I am considering replacing the DS412+ with a DS918+ which has a more powerful cpu and SSD capability with the aim of improving the response when navigating the library. Are you suggesting that there is no point in having SSD in this setup? Hi-Fi 1: Airport Extreme bridge > Netgear switch > TP-Link optical isolation AND PS Audio PerfectWave Transport > PS Audio DirectStream DAC with Bridge Mk.II > Primare A60 > Harbeth SHL5plus . I suspect that if you check under the hood as I did with my DS214play you will find your DS412+ NAS motherboard is limited to SATA II speed internally. Making sure the NAS uses SATA III will be my hot button in a next NAS purchase. went back to WD Red hard drives as more cost effective. to a Pentium processor should help library navigation. Thanks for the clarification. I was thinking in terms of adding SSD as cache storage in addition to main storage on 4 WD Red drives in the expectation that this would improve performance.